Brunch is more than just a way to cure a hangover after a long night of partying hard in Las Vegas. Let's take a look at the best places to combine breakfast and lunch (while enjoying a drink or two... or unlimited) in Sin City. The "Patio Brunch" offers plenty of outdoor seating and people-watching on the Strip, Saturday and Sunday 8am-4pm. Enjoy signature dishes like the banana and mascarpone stuffed French toast while sipping a bloody mary (or maria) crafted table-side with your choice of frozen vodka or tequila for $18 each. Bobby Flay’s spot has $10 Bloody Marys with a spicy kick that complement the Southwestern style breakfast platters, including but not limited to: the blue corn buttermilk waffle and scrambled eggs chilaquiles. The newest brunch on the Strip definitely fits among the best. STK Brunch Club offers a party atmosphere with live music and a fun bloody mary service where you can walk up to the bar to pick out your own garnishes (or choose a green tomatillo mix as an alternative). Even better than the smoked salmon or pork belly Benedict you'll find on the menu is the rolling coffee cart, where you can have a cappuccino or boozy java drink made table-side to wrap up your meal. 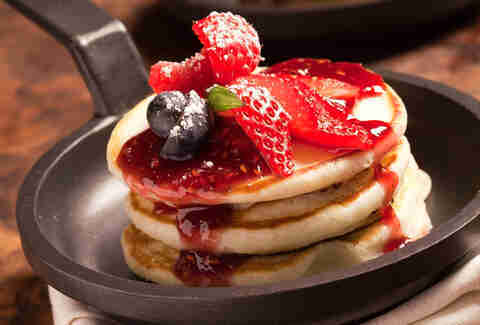 A three-course brunch is just $38 and includes the waterside view of the Bellagio fountains. The first course is a nice selection of baked pastries followed by a lighter dish (such as the quinoa salad) and then a more savory option (like an eggplant Parmesan Benedict). The bellinis are almost a little too sweet, so go with the all-you-can-drink bloody marys for $28 instead. The Mariachi Brunch runs 11am-3pm Saturday and Sundays with two-for-one margaritas and breakfast food served with a little inspiration from south of the border. The breakfast burrito comes loaded with scrambled eggs, smoked bacon, Oaxaca cheese, lettuce and salsa for $13. Proving to be much more than the best chocolate factory in Las Vegas, Hexx is serving up a brunch menu that includes five unique bloody mary creations including the Farmers Market, made with bacon-infused gin or The Colossal, which is so big, it comes in its own pitcher. As for the food, you have to try the savory carnitas hash and the sticky sweet baked French toast made with mascarpone and the restaurant's signature house-made dark chocolate. Michael Mina's latest Las Vegas restaurant offers a fun French take on brunch, Saturdays and Sundays 10am-3pm. Your best bet to wash down the foie gras parfait or prime steak tartare is the bottomless rosé. Available Friday-Sunday from 7am-2pm, this French bistro from Thomas Keller offers a nice take on the traditional beignet, as well as a tasty Poulet et des Gaufres (which is just a fancy name for roasted chicken with a bacon and chive waffle). And don't forget... Dom Pérignon by the glass. The popular spot from Giada de Laurentiis expanded its menu last summer to include brunch with cool stuff like lobster hash or a chicken cacciatore with a parmesan polenta waffle. Limitless La Marca mimosas are available for $30, but you can shell out a few extra bucks and upgrade to Moet & Chandon, Ferrari, or Veuve Clicquot. Enjoy a twist on traditional brunch dishes like the English bagel tacos and lobster Eggs Benny 9am-2:30pm Saturdays and Sundays. Go crazy and design your own creation from the Bloody Mary cart, where the garnish includes everything from chicken wings to cheeseburger sliders. The price depends on how much stuff you load on your drink. The Sterling Brunch may seem pricey at $90 but it also includes American sturgeon caviar, stone crab, lobster omelets, and best of all, unlimited pours of Perrier-Jouet Champagne which is almost worth the price alone. 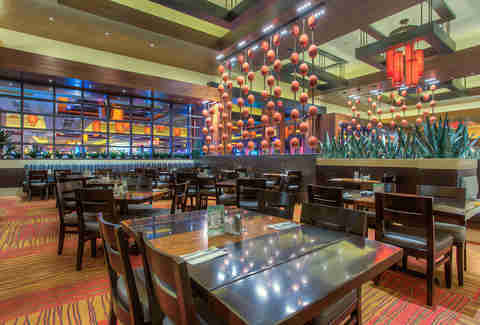 One of the best buffets in Las Vegas has a weekday brunch from 8am-2pm and a weekend version that goes an hour longer until 3pm. 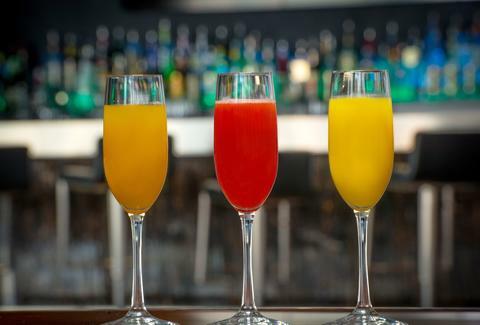 Take advantage of the complimentary glass of champagne, Bloody Mary, or mimosa. The Party Brunch takes place every Saturday from 2pm-6pm. It’s designed for people who like an expansive selection of Champagne, salmon and scrambled eggs on their pizza, and are waking up on the late side after a wild night at the club. Unlimited small plates include huevos rancheros and egg white Oysters Rockefeller for just $35, Saturday and Sunday 10am-3pm on the poolside patio. Wash it down with $10 bottomless mimosas and enjoy a view that overlooks the Beach at Mandalay Bay. The weekly Sunday brunch offers up bacon carved on the spot and an amazing antipasto selection among five stations, from 10:30am-2:30pm. Add $14.95 to the bill and you get your choice of bottomless sangria, Bloody Marys, Bloody Caesars, selected beer, frozen cocktails, and wines by the glass. From 12pm-2:30pm on Sundays you can indulge in one of the most unique brunch menus in Las Vegas. The food offers sushi and other high-end Asian or Indian cuisine to go along with Perrier-Jouet Brut Champagne for $35, or mimosas for $19. On Sundays from 10:30am-2:30pm there's veal short rib hash, mushroom grits, pancakes with berry compote, and other tray-passed bites for $48, making it one of the best brunch deals on the Strip. 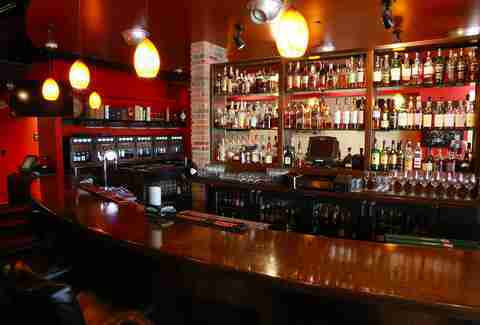 Add on another 20 bucks for bottomless sparkling wine, bloody marys, or build-your-own mojitos. Stop by everyday 8am-11am for morning bites like huevos de nachos, croissant French toast, and a tasty breakfast quesadilla. Bottomless mimosas and bellinis are $24.99, but you can never go wrong with a Cabo Wabo margarita... even at 9am in the morning. A lot of Vegas buffets tend to look the same after a while (or a couple days), but Le Village Buffet stands apart from the others with a one-of-a-kind crepe station that nearly makes the $31 brunch price worth it... and perfect with the Champagne that’s included. The Jazz Brunch on Sundays comes with (as you may have guessed) live jazz music, a relaxed atmosphere, and an appetite for the finer things like a shellfish station with king crab legs, Louisiana crawfish, and wild caught shrimp. Don't forget to try the French toast bread pudding. The brunch also has unlimited Veuve-Clicquot Yellow Label Brut for $65, or endless pours of Bertrand Rose for $25. Aside from being one of the best things about the rejuvenated downtown area, Pizza Rock also offers a Sunday Acoustic Brunch 10:30am-2pm with live music and dishes like the meatball hash n’ eggs. For $10 you can get a 22oz bacon Bloody Mary or bottomless mimosas with a juice selection that includes orange, strawberry, mango or blood orange. Why wait for the weekend? Bottomless Bloody Marys are available all day, everyday for $15. Due to the liquor license, they’re actually made with sake instead of vodka -- but it works perfectly with a housemade Bloody Mary mix and the chef’s own specialty pickles. 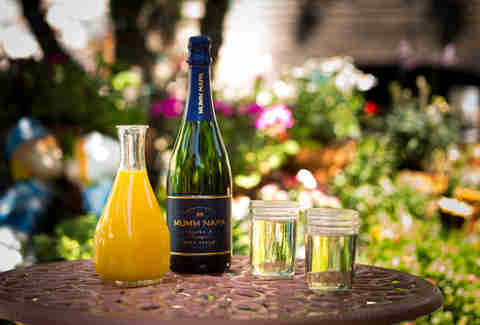 The Patio Pounder is a bottle of Mumm Champagne and a carafe of OJ for $20. Otherwise, for an extra buck you can get a pitcher of the Skyy White Peach Sangria. From Saturday and Sunday -- 10am-3pm -- you can grab an outdoor table on the second floor of the Container Park and order up sticky monkey bread dripping in brown sugar and butter, steak and egg tacos, and brioche French toast with cappuccino cream. Finish it all off with an Irish coffee. One of the most inventive brunches in Las Vegas takes place every Saturday and Sunday from 10am-3pm, with fun dishes like poached duck egg and wild mushroom toast Benedict or the roasted squash and asparagus quiche. 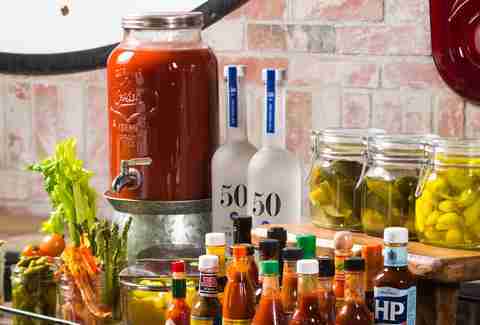 But the best part is the bloody mary table-side cart, with two bottles of 50 Bleu vodka, jars of garnish, and bloody mary mix for $70. The Sunday brunch (10am-2pm) gets off to a good start with an order of house-made donuts followed by inventive dishes like a caramel custard French toast or the world's greatest grilled cheese sandwich with brie, cranberries, and apples on whole wheat bread. There's also a choice of three bottomless Champagne cocktails for $19. The Jazz Brunch comes around on the first and third Sunday of each month. It includes live music, a selection of traditional breakfast favorites, and choice of one JW Signature Pomegranate mimosa or bloody mary included in the $24.99 price tag. Brunch is from 10am-2pm on weekends, but usually lasts a little longer on Sunday. The menu is divided into categories like “sweet” (chocolate chip pancakes) and “savory” (jerk fried chicken & waffles) and can be washed down with $20 bottomless mimosas. The brunch on Saturdays and Sundays (from 9am-3pm) make the most of the in-house butcher shop, with dishes like the short rib hash and steakhouse scramble. Bottomless mimosa are $16. Dishes like the Farmer’s Toast with crushed avocado, radish, carrots, fennel, and grilled wheat bread are among the tastiest farm-to-table items you will find during any brunch. Stop by on Saturdays and Sundays 10:30am-2:45pm and order the Green Goodness juice with kale, apple, fennel, cucumber, celery, lemon, and ginger... or booze it up with $20 bottomless mimosas or $25 bottomless bloody marys. Need something to wash down your Vienne schnitzel with poached eggs? The weekend brunch runs 10:30am-3pm on Saturdays and Sundays. Mix moscato with either strawberry pulp, mango punch, or peach juice for $8 a glass or $30 a bottle. Traditional mimosas are $5. While the breakfast tacos and asparagus egg scramble are pretty awesome, the best reason to stop by would be the four champagne and sparkling wine choices by the glass... or you can not think about it too much and just go with $20 bottomless mimosas. Weekend brunch runs Saturdays and Sundays, 11am-3pm. Henderson’s best buffet offers a Champagne brunch on Sundays from 8am-4pm (with the bubbly included). The brunch menu will officially be introduced in mid-February, but there's no need to wait. Henderson's one of the best new restaurant of 2015 and only does breakfast and lunch, seven days a week. So you can't go wrong with anything on the regular menu, whether it's a waffle topped with foie gras or a wickedly authentic Monte Cristo. Need a good drink (or three) to start the day? The mimosa trio sampler is made with your choice of three fresh fruit purees, including orange, white peach, pomegranate, passion fruit, lychee, guava, and cherry for $10. As for the famous crepes, if you come up with your own creation, it may get added to the menu and named after you (maybe). The Liquid Brunch offers “almost bottomless” Bloody Marys or mimosas every Saturday and Sunday 11am-2pm and comes with a complimentary order of the signature arancini -- which is a fancy word for stuffed Sicilian rice balls. 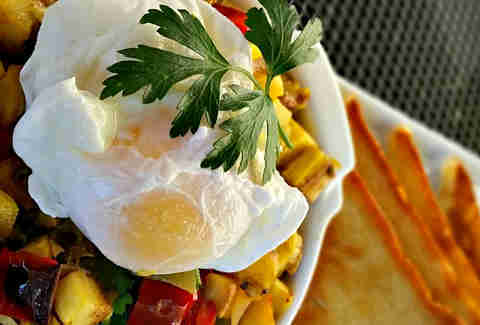 New brunch items include chilaquiles, "Mama's Fried Chicken" and croque madame. The restaurant in front of the Hard Rock resort is hosting a gender-bending "Drag Brunch" 10am-1pm during the fourth Sunday of each month, with unlimited mimosas for $20. Consider the drag show a bonus. Pink Taco has revamped its Sunday brunch with a menu of Mexican-inspired dishes like huevos rancheros, plantain French toast, and chicken enchiladas. Drinks include the $15 Bloody Sunday with Jameson, Sriracha, Pink Taco's own bloody mary mix, crispy costilla, and escabeche. All margaritas and sangria are available by the pitcher. Wake up with their “Eye Openers" for just $10. That nets you bottomless mimosas or bloody marys 10am-3pm every Sunday. 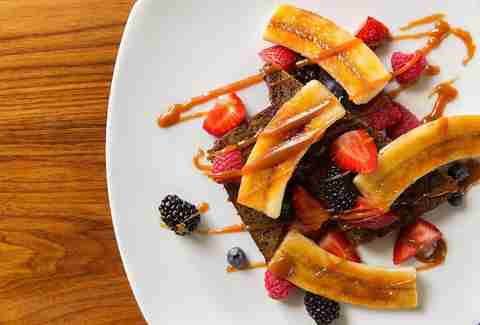 Perfect on the patio with bananas Foster French toast. You get more than just a buffet on Saturdays and Sundays. You also get a Champagne brunch 7am-3pm that’s only $10.99 with a Players Club card. Rob Kachelriess considers a bloody mary the perfect chaser for a Bellini. Follow him on Twitter @rkachelriess.